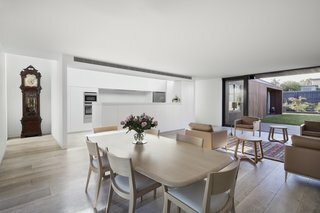 On the Australian coast, a forever home offers an adventurous couple a comfortable and worry-free home to age in place. 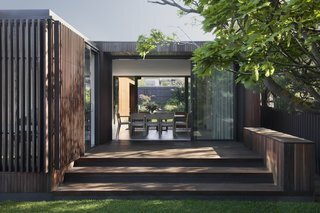 When an older couple approached Prahran–based Coy Yiontis Architects to design a home to age in, they asked that the new house be almost everything that their existing residence was not—contemporary, low-maintenance, and brimming with smart home technology. A south elevation view of the front entry reveals its angular composition. The roofing is Spandeck by LYSAGHT in the Monument finish. 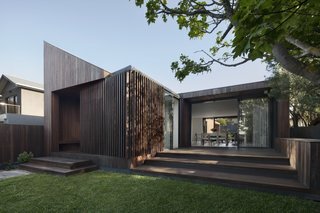 The home is clad in sustainably sourced spotted gum. 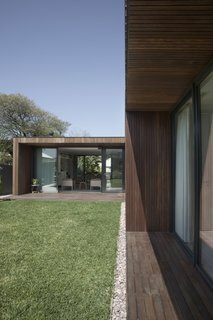 A natural material palette is used throughout. 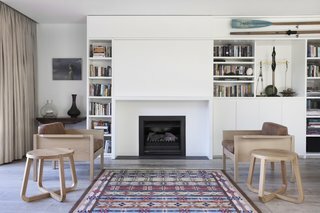 At the time, the clients had been living in a grand, heritage, country homestead and wanted to downsize to a smaller home along the coast of Barwon Heads in Victoria, Australia. 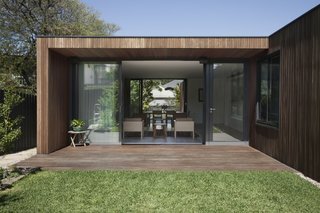 The main living space opens up via full-height, glazed sliding doors to outdoor courtyards on the northern and southern sides. 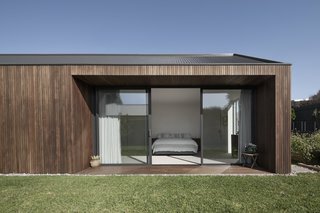 "Comfort, ease of maintenance, and facilitation of established daily rituals were primary elements of the clients’ brief," explains the firm of the highly customized and "consciously contemporary" home. 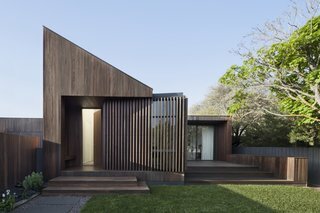 Constructed in just nine months, the design of the timber-clad building—dubbed the Humble House—was informed not only by universal design principles for comfortable aging in place, but also by existing site conditions that shaped the resulting dynamic facade. The master bedroom faces the east to capture the morning sun. 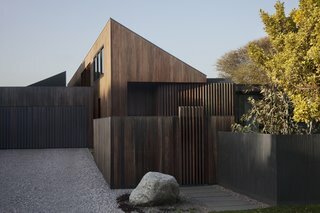 The north elevation in the rear of home has few windows for privacy. The volume to the left houses the master bedroom while the rightmost volume contains the walk-in closet. Stretched across a single story on a sloped site, the 2,206-square-foot home features a long and elevated profile along the west boundary to protect against views from its two-story neighbor. 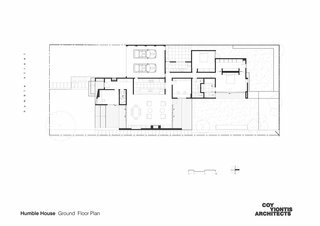 On the northeast side of the home, the master bedroom and the living spaces are set on a single, continuous level with the outdoor gardens. Meanwhile, the living spaces are carefully oriented to optimize natural ventilation and lighting, a site-specific strategy that—in addition to energy-saving systems like hydronic heating and electric blinds—has helped the project earn a 6-star energy rating (BERS). The energy-efficient home includes water tanks plumbed into sanitary units and double glazing throughout. 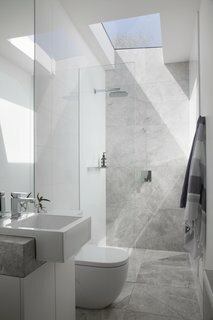 The light-filled ensuite bathroom includes a Nickles showerhead and MIZU taps. "The clients revel in the ‘touch button technology’ throughout the home," note the architects. Royal Oak engineered boards with hydronic heating were installed throughout. There are no steps in the home to facilitate ease of living as the homeowners grow older. 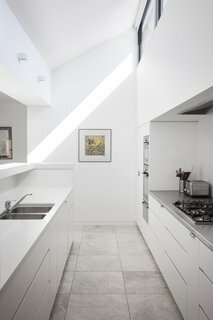 "Also important are the small touches that aid day-to-day living," say the architects, "a bench seat at the front door for removing dirty boots, the outdoor shower for rinsing sandy feet after a beach visit, the secret hatch in the garage that accesses the internal kitchen pantry directly so that the heavy grocery bags don’t have to be lugged." The white kitchen is equipped with NEFF appliances as well as Caesarstone Snow and stainless-steel countertops. 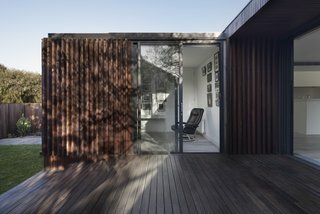 The operable glazing that provides seamless connection with the outdoors are of the AGS 900 Series by CAPRAL with retractable flyscreens by CENTOR. 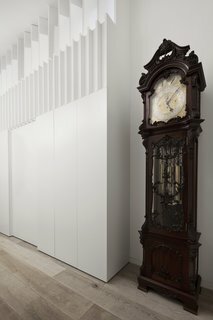 A glimpse inside the entry hallway anchored by a grandfather clock. 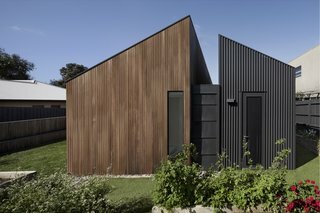 All the joinery is custom-made by SCLK Moolap, Geelong. The flexible floor plan caters to the clients’ love of entertaining. This private study, for instance, can be easily converted into a bedroom.